We pride ourselves on manufacturing a top-grade custom EPDM gasket with the highest quality EPDM gasket materials available. Gasket Engineering is the one-stop-shop for converting EPDM gasket material into the exact specifications and tolerance requirements you need for your custom EPDM rubber gasket or custom EPDM rubber seal. With our highly skilled professionals and multitude of capabilities, we can manufacture a variety of EPDM rubber gaskets across several varying industries. EPDM, Ethylene Propylene Diene Monomer, is an “M” class synthetic rubber elastomer. 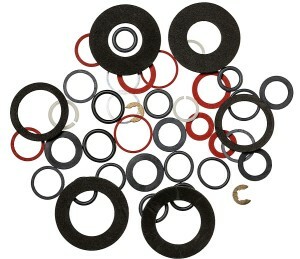 EPDM gaskets are very popular and versatile polymer application. Because of the high-quality raw material suppliers we use, these manufactured EPDM gaskets and EPDM seals are resistant to ozone, weather and aging. EPDM offers excellent resistance against wind and ultraviolet light as well. Our high-quality raw materials ensure that EPDM gaskets produced by Gasket Engineering are also superior resistors to water and steam, maintaining flexibility at low temperatures. EPDM also offers resistance to particular metals and acids. With its distinctive color stability, EPDM rubber gaskets and EPDM rubber seals will not stain other mating surfaces. EPDM gasket material is not recommended for resistance to oils. EPDM rubber gaskets and EPDM rubber seals are the ideal choices for outdoor applications. An EPDM seal is also sulfur and peroxide curable. EPDM can withstand temperature ranges from -40°F to 250°F (-40°C to 150°C). EPDM also possesses electrical insulation properties, making it suitable for use in electrical applications and equipment. EPDM gasket material can be found in applications ranging from belts and hoses to complex applications such as mass transit. Custom EPDM rubber gaskets and EPDM rubber seal applications have been utilized within industries such as aerospace, construction and energy. Due to their elastomeric properties, custom EPDM rubber gaskets and custom EPDM rubber seals are very popular throughout various industries. We produce the highest standards of quality and tolerance, securing EPDM materials that can withstand extreme environments. Our ever-expanding capabilities allow us to utilize cutting-edge equipment to convert those raw materials in the exact shape, dimensions and thickness required. Get your FREE Rotary Ebook By Clicking Here! Gasket Engineering will manufacture your custom EPDM rubber gaskets and custom rubber EPDM gasket seals for your niche industry. We have serviced the industrial, heavy equipment, energy, aerospace, marine, automotive, alternative energy, electronics and medical industries. We have over six decades experience and we can handle any custom EPDM rubber gasket manufacturing project, no matter the quantity. Our capabilities include die cutting, dieless cutting, rotary cutting, laser cutting, slitting and laminating. We can custom manufacture any size or shape and ensure you are receiving the highest quality grade EPDM seal. Allow the highly skilled professionals at Gasket Engineering to select the appropriate gasket material for your manufacturing project. Contact us today or visit our request a quote page and fill out a form. We look forward to manufacturing your next custom EPDM gasket! Note: If you are looking for material data sheets for EPDM Gaskets & Seals, check out the Rubber & Plastics tab in our Materials section.